Hey, there! I’ve been enjoying some time off this week, hanging out with my son Jake, who’s on his Winter Break, and working my way through a stack of great books. I’ve also been keeping up with the real estate listings. This sunny yellow Gothic Revival-style home caught my attention, so I’m popping in today to share it with you. 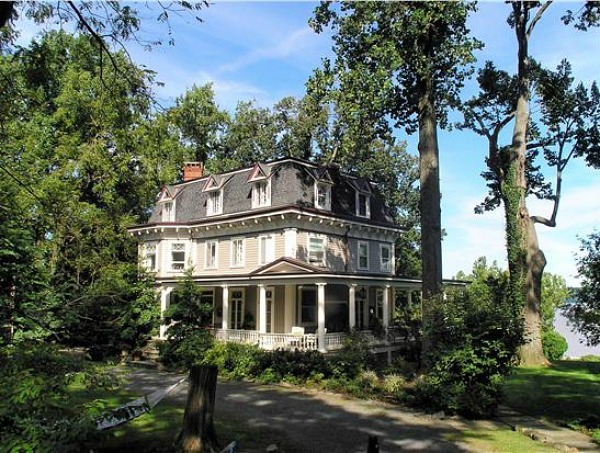 It was built in 1845 on a hill overlooking the Hudson River in Nyack, New York. Take a look! Since the middle of the 19th century, the William Dickey House has been the centerpiece of what many consider Nyack’s most desirable block. The mansion has been beautifully restored, preserving its Gothic Revival detail while adding features including new heating systems and a Vermont slate roof. “Mr. Dickey was actively identified with the early history of Nyack, and was one of the few who have been permitted to watch its growth from the time it was a mere hamlet until it is now a flourishing town, with bright promise of becoming a city in the future. He was born in this place on September 2, 1808, and has nearly always resided here. It’s a big house with over 6,500 square feet. “It is currently configured for three families with a three story, 4,900 sq. ft. owner’s residence. Legally a four family, the inherently flexible design can be adapted to many possible uses while retaining the home’s historic charm.” So, hey, you could earn some rent money while you lived here, too! The house has three stories and a 19th-century carriage house on the property. P.S. There are some gorgeous old houses in Nyack. Remember this one? The crown moulding and window/door trim in this house is bananas!! And that balcony…. Beautiful. Nyack is a fun little town too. Lovely! Reminds me of Uptown/Garden District homes in New Orleans. So gorgeous!!! At $1million+, yes, I’d need to have some renters to help with the mortgage payments! I love the fireplaces, the windows, the original moldings, etc. I’m so glad to see the original radiators, too, and no recessed lighting, after the renovation – hooray!! I don’t know if the woodwork was ever unpainted, but I like the white. I don’t mind painted woodwork in Victorians (sometimes it was always intended to be painted). It’s in Craftsmans where it seems like a crime. Anyway, being on the Hudson River, in a beautiful town, with a very short trip to Manhattan, sounds lovely to me. Years ago I toured the Hillcrest Mansion in Aurora, IN and learned the reason why some old homes have such large windows -it came down to taxes. At that time they were taxed on the number of doors the house had. Homeowners put in big windows that doubled as doors (but was technically still a window) and paid less in taxes. Mmm…the rooms are coated in buttery goodness. Now, I want popcorn…and a slightly warm croissant. The view is fabulous. I love these old historical houses and this one is sunny too. A plus for me at any rate. Gorgeous and tasteful. Love everything, but I feel a bit sad that it’s been divided into units.